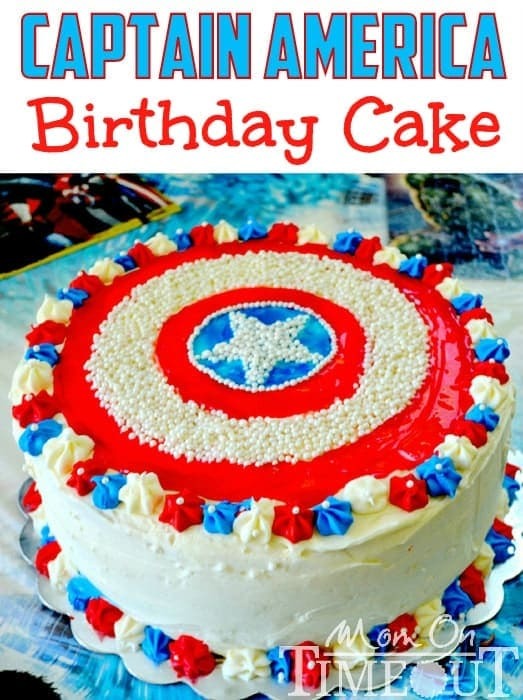 This tutorial for a Captain American Birthday Cake is sure to delight all Avengers fans! We celebrated Reece’s 6th birthday this past weekend. It’s hard to believe that my little boy is already six! Reece really wanted an Avengers birthday party and so I did my best to make that happen for him 🙂 He hand selected most components of his party and the cake was no exception. This cake would also be awesome for the 4th of July! The cake itself is 3-layers, 12 inch round lemon cake with lemon cream cheese frosting. Yes. 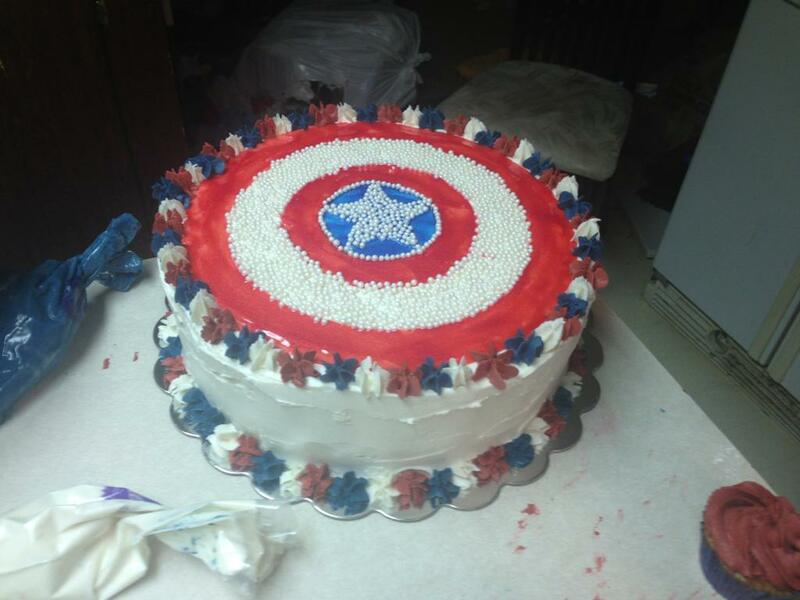 The cake was huge and that’s exactly what I needed to make this cake really look like Captain America’s shield. I used a star cookie cutter (with the tag still on it!) to get the star just perfect in the center. I poured the sprinkles in and just patted them down softly so that they would stick in the frosting. I found various objects that were circles (including paper) to make near-perfect circles on the cake. I drizzled the sparkle gel and then used the back of a spoon to very carefully smooth it out. It’s a little hard to tell from the pictures, but the sparkle gel really does sparkle – it looked amazing in person! I used tweezers (new ones of course!) to place the sprinkle beads one at a time around the star. That was really time consuming but I think it looked really cool! Here it is in all it’s glory! The most important thing was that Reece love it and he really, REALLY loved it! I finished the cake around 11 p.m. the night before his party and shortly afterwards he woke up and wanted to be tucked in again. I told him I finished the cake and so around 11:30 p.m. the night before his birthday, I took him into the kitchen and let him peek at his cake. His eyes were squinting from the refrigerator light but they sure lit up when he saw the cake 🙂 He was so excited and happy – it made dealing with all those little beads worth it! 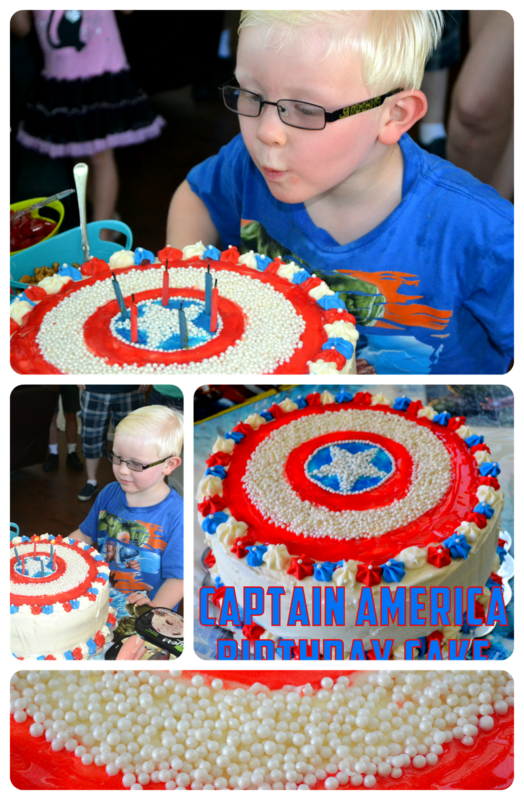 I’ve got lots more fun ideas to share from Reece’s Avengers party coming soon! « 10 Fabulous 4th of July Ideas! Do you remember which star tip that you used for the edges? This is such a great cake! I’m hoping to be able to make it for my sons birthday next weekend. I have two questions for you: how thick we’re each of the layers, and about how much frosting do you think it took to frost? I did three layers and the cakes were about 1.5 inches high. I used quite a bit of frosting because I used a 12 inch cake pan. I’m guessing 4-6 cups of frosting 🙂 Make plenty! So glad you’re giving this a try Liz! I mapped the circles out using paper and a compass to make sure they were equal, and I just dipped a tooth pick in some shortening to pick up each pearl to go around the blue part, but I think it turned out awesome! I LOVE it Liz! It turned out so fantastic! Yay! They have famous 6 the birthday and they have also published the 6th birthday party shared we can know that and understand them expensive instant life. It is amazing and good post shared so greatest st and creative post shared. Such a cute cake!! I love love Captain America and this is so sweet!! Amazing job!! Thank you so much Tianna! He loved it too!